Well, the contest yesterday ended much sooner than I expected. Mavis guessed "sunflower garden" yesterday afternoon, hitting the nail pretty much on the head. Therefore, she is the winner of a one-year subscription to Mother Earth Magazine. Congratulations, Mavis!!! (Please email me your address, so I can get Mother Earth News to you.) For the rest of you who guessed, I wish I could buy you all subscriptions. Instead, I'll give you some sound advice...I know it's only April, but find paper and pen and at the top write "My Christmas/Birthday List" and add Mother Earth News underneath. You'll be glad you did. 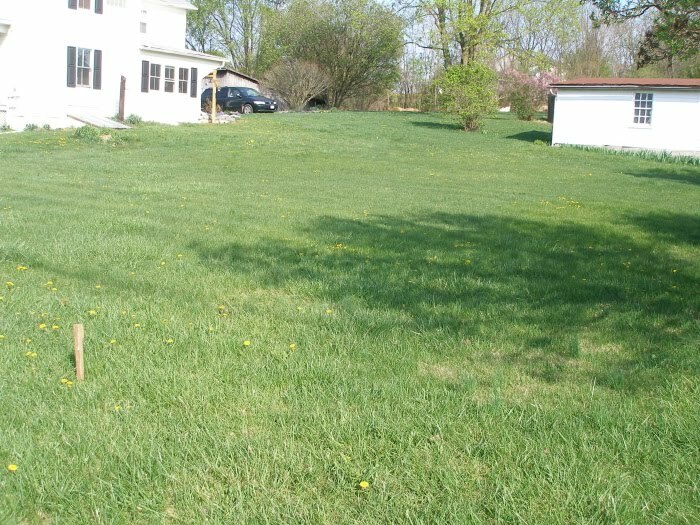 There are two really large lawn yards on either side of our house and some lawn in front of it. Behind our house (the back 2/3 of our property) there is also lawn, but most of it is outbuildings, gardens and a small orchard. Ever since we moved here five-some years ago, we have bemoaned the amount of lawn we have flanking our house. Lawn is such a poor use of land. We can't (well, don't) eat the grass. The kids are too small to play in those front lawn areas because a busy road is nearby. It takes gas (via mowing) to keep it under control and neat looking. Then, there is the waste of time spent mowing all of it. We've toyed with several ideas over the years as to what to do with the lawn/land. Some of our ideas have been; blueberry bushes (lots of them), wildflower gardens, wheat patches (to feed us and our chickens), more red raspberry bushes and a field of asparagus (yes, we love it that much). We love all those ideas, but with Jamey keeping busy with pharmacy school, adding a baby to the mix last summer, homeschooling and general maintenance and care of three children, a marriage, a home, garden and chickens, we decided to wait a bit, bite the bullet and mow it for now. That's where my brother comes in. He lives nearby and started talking about his interest in growing sunflowers to sell around town. We cleared our throats and raised our hands and, as quick as we could muster, offered any and all of our lawn yard for the cause. My brother is more than welcome to use the lawn yard (and the one on the other side of the house if he likes) for as long as he wants. 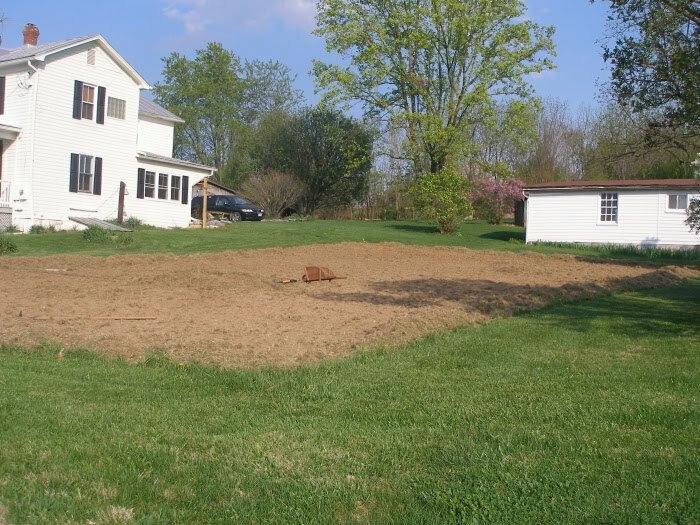 When he's done with it, we will have a 40 x 70 foot bed ready to support wheat or red raspberries or asparagus. Do you know what I'm going to see out my kitchen window in a month or so? A little field of sunflowers. And, the best part? Jamey and I don't have to lift a finger. And I now have less to mow (less gas to buy, less pollution to send into the air). Now do you understand why I'm so excited? Now, for those of you who are local, some of these sunflowers will be for sale at the end of our driveway. I'll keep you posted as to when they will be ready and I'll be showing many pictures of the progress of my brother's sunflower beds. Thanks so much for helping make my sharing of our plans so much more exciting by participating in my little contest. You're all so fun:-). What a wonderful idea! Thanks for praying for Tiffany and her family. Stringofpurls, You're welcome. For everyone else, please read this article and pray for the family going through this tough time. Stringpfpurls attends church with this family. We are to pray without ceasing. Let's get to it. Great idea and I love how it benefits multiple people! I linked to your blog today. Watched Bees: Tales from the Hive over the weekend and really enjoyed it. Keep those recommendations coming! Oh my gosh...it's going to be SO pretty..! A win-win situation! That is going to be gorgeous!! :) How nice to have such a nice view without having to maintain it! Blessings to you! Can't wait to see them! congrats, Mavis! Can't wait to see the pictures when all are is bloom! Ohhhh! That will be beautiful!!! Can't wait to see lots of pictures over the summer! How clever. If it isn't pasture than lawn really is a pretty big waste of space. How pretty! Can't wait to see the field of flowers. I might have to copy you next year. I have 3 acres to mow... it takes me 3 gallons of gas and 3 hours of my life that I will NEVER GET BACK every time I mow the whole yard... I like your sunflower garden idea! We live on something of a busy road and I think we might be able to pull it off! We grew a few flowers last year, so I have plenty of seed! Hopefully people don't mind the pollen as much... otherwise I hope join you guys as apiarists with top bar hives... I'm sure they'd appreciate it!